This post was written by guest blogger Lori Biesen, CSR Consultant, Corporate Affairs Marketing, Cisco. FY18 was a significant year for CSR in many ways – Blackrock’s CEO Larry Fink came out strong in his annual letter titled, “A Sense of Purpose,” emphasizing the importance that business considers their impact on society and the environment. Companies continued to take a public stand on issues such as equality, immigration and more. At the same time, 68.5 million people had been driven from their homes, contributing to a global refugee crisis. We experienced some of the largest natural disasters in history, and scientists continue to emphasize the urgency of addressing the impacts of climate change. 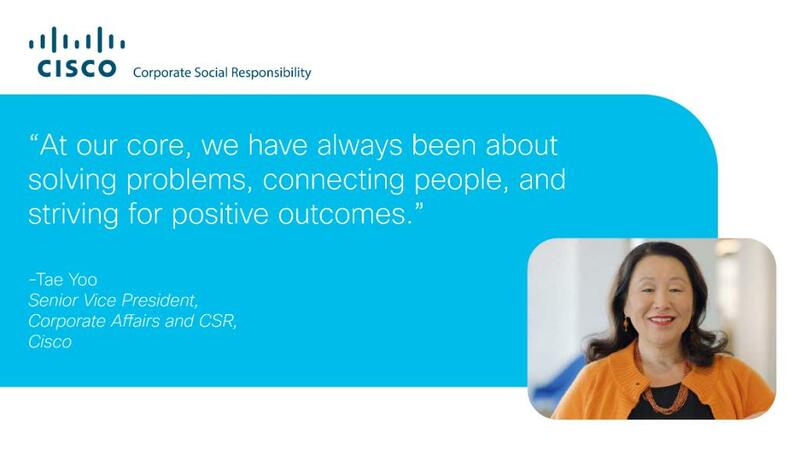 At Cisco, we recognize we cannot solve the world’s problems on our own, but we have an opportunity and a responsibility to do our part. Last week we launched our 2018 Corporate Social Responsibility Report, celebrating our achievements to date as well as how we are addressing the areas where we can do more. We structure our report in two sections – Our Story – a summary of our key accomplishments in 2018, followed by The Details, which delves more deeply into the programs and strategies that are helping us reach our goals. We continued to increase employee engagement reaching 46% in FY18 (424,000 total volunteer hours and $21.4 million in donations/matching gifts), with a goal to reach 80% employee engagement by 2020. Cisco and the Cisco Foundation donated $383 million in cash and in-kind contributions(an 8% increase from FY17). From our Earth Aware employee volunteerism and awareness campaign to our Be the Bridge annual giving campaign to our Cisco Citizen Networks to employees using Time 2 Give for five paid days per year to volunteer, making a difference in our communities is an integral part of our culture. Additionally, with 27% of our board female, 42% of our Executive Leadership Team (ELT) female, and 58% of our ELT diverse in terms of gender or ethnicity, Cisco is an industry leader in the diversity of its leadership team, and today, Cisco is the most diverse in its history. We continued working towards our goal to positively impact 1 billion people by 2025, reaching 209 million people worldwide in FY18 alone (a 34 percent increase over FY17). For example, we celebrated the first anniversary of our partnership with Mercy Corps, where we are helping transform humanitarian aid through digital solutions. We have already reached 1.3 million people, with the goal to reach 11 million by 2022. Additionally, we continued our multi-year support of Opportunity International, including cash grants, donations of Cisco technology, and expertise, helping the organization provide 11 million people with access to financial services and supporting the creation of 2 million jobs in 2018. Networking Academy had a record year of enrollment with 1.87 million students across 180 countries, placing it as one of the largest and longest-running education and employment CSR programs around the world. In FY18, we continued to expand our courses and workshops, as well as introducing the Talent Bridge Matching Engine, which automates the process of connecting Networking Academy students to jobs with Cisco and Cisco partners. Available in 15 languages, 200 employers have posted 10,000 entry-level positions, with 6,400 students connected to job opportunities through the matching engine. While our business grew, we reached our Scope 1 and 2 GHG emissions reduction goal and are working towards a new one, with a 45% reduction since 2007. Additionally, we reported our greenhouse gas emissions to the CDP for the 15thyear, and have received more awards for disclosure, performance, and A-List CDP than any company. We invested $9.9 million in implementing 145 energy efficiency projects. Additionally, at the end of FY18, we had avoided 910,000 metric tonnes of carbon emissions in our supply chain, the equivalent of over two million miles driven by an average passenger vehicle. While delivering more competitive and robust products, we continued increasing the energy efficiency of our products, working towards our new product power efficiency goal. We are also setting aggressive goals to support a circular economy inside our business and beyond, including a goal todecrease the use of virgin plastics by 20% by 2025. Cisco technology and our employees and partners are accelerating global problem solving in ways that have never been attempted before. From solving customers’ business challenges to tackling the toughest social and environmental issues of our time, we are helping to make the impossible possible. To learn more, please visit our CSR report, including an interactive summary here.